Having available option parts for a popular vehicle makes the hobby just that more fun and interesting. JConcepts has rolled out a sweet looking replacement motor plate for the popular B6 vehicle with lay down 3-gear transmission. With the evolution of race tracks, high flying jumps are becoming the normal obstacle. Its inevitable that a driver will have a miscue and challenge the durability of the vehicle. Your racing friends over at JConcepts have taken a lot into consideration while designing and developing a replacement motor plate. Looking at the typical construction of the second operation processes on standard motor plates, it easy to see why bending is sometimes an issue. 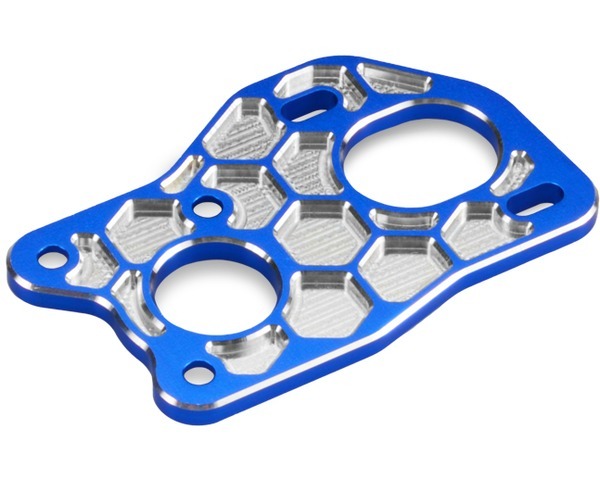 The design team at JConcepts has incorporated a honeycomb milling affect with placement more suited to surrounding geometry making the plate light-weight and very rigid in multiple directions. The honeycomb features add a 3D look especially as they remain natural aluminum while the rest is blue. Slight chamfering on the 3mm thickness material allows the rather beefy plate to look quite slim and trim. Honeycomb it out with JConcepts.